George Burns and Gracie Allen, Lucille Ball and Desi Arnaz, Sonny and Cher, Captain and Tennille. What do these famous celebrity couples have in common? They chose to spend many, many hours of their professional and recreational life together. Several local couples in Lawrence have chosen to do the same and found this union of work, life and marriage to be a worthwhile partnership. 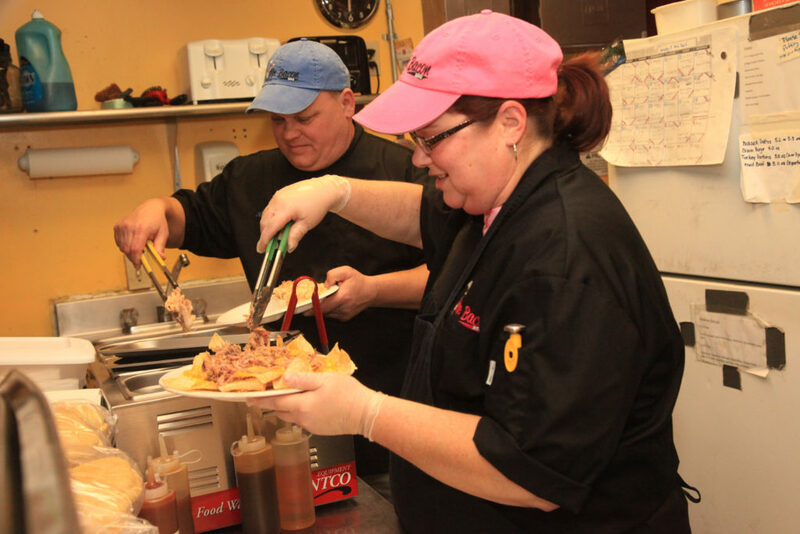 Jeff and Valery Frye, Lawrence, work together in their catering and barbecue sauce business, Mr. Bacon, at Conroy’s Pub, 3115 W. Sixth St., on a recent Friday night. “It is easier to say how often we are not together,” reports Valery Frye, who owns a business with her husband, Jeff Frye. About every three weeks, the two can be found behind the kitchen window or out visiting with customers of Conroy’s Pub, 3115 W. Sixth St., Suite D. Their work on a Friday night begins several days in advance with co-planning the menu, experimenting with recipes and putting the meat on the smoker. The production of their bottled barbecue sauces is another venture of many hours together. Working together in their business, Mr. Bacon, a catering and barbecue sauce production company, was not much of a jump for them. Jeff’s previous job allowed him to work from home. Now the Fryes each have their own separate offices in their home to manage their individual responsibilities of their expanding company. After 30 years of marriage, Valery has the magic word for their success: patience. To relax and get away from work, Jeff and Valery sit down together at night and will watch an agreed-upon television show. “We chill out and make it nonbusiness. Sometimes this time doesn’t begin until 10,” Jeff says. Rib eye steak with mushroom and red wine sauce, a twice-baked potato and dessert made by Val all over a shared bottle of wine and candles will be on Mr. Bacon’s table this Valentine’s Day. Even if isn’t until 10. Todd Bradford and his wife, Rochelle Tramp, a State Farm agent/owner in Lawrence since April 1, 1992, estimate the amount of time spent together figures out to 160 hours per week. Their time flies when they speak of work responsibility, family responsibilities and carving out individual for his and her recreational hobbies. When Todd and Rochelle are at work, she technically is Todd’s boss. Even today, Rochelle will often be asked by friends about she and Todd’s working relationship. Before Rochelle hired Todd, who had been an employee of State Farm’s health department for 15 years, she was given a specific bit of advice from another agency owner. “Circumstances dictate what you do away from the office,” he said. An example of this was a few Christmases ago when a client called them at home because of a house fire. Valentine’s Day will most likely consist of dinner at home or out after coaching one son’s basketball practice and attending another son’s basketball practice. Alexei and Carrie Nikitin work together from their home in southeast Lawrence. Gazing into each other’s eyes and stroking hands, Alexei and Carrie Nikitin begin to elaborate on their partnership in marriage and business. Both of them agree their strong chemistry for the other still didn’t make it easy at the start of their relationship. Carrie disclosed their differences sometimes made their relationship a challenge. “He is Soviet-Russian, I am Cold War American, his work is very individualistic and mine is about relationships. We grew to respect and understand each other,” she says. Today, Alexei and Carrie are business partners in two companies, Avatekh Inc., a high-tech start-up in Lawrence, and Horizon Analog, Inc, Avatekh’s associate company. Carrie and Alexei enjoy discussing business at home in their offices across the hallway from each other or even on walks. On Saturdays, the two spend all day together attending movies, concerts, local theater productions or going on walks to recap the week’s events. Sitting down to talk about business outside of work is one factor that keeps their relationship strong. A quick overnight get away with romantic dinners and movie watching will be on the plate for Alexei and Carrie. Drs. 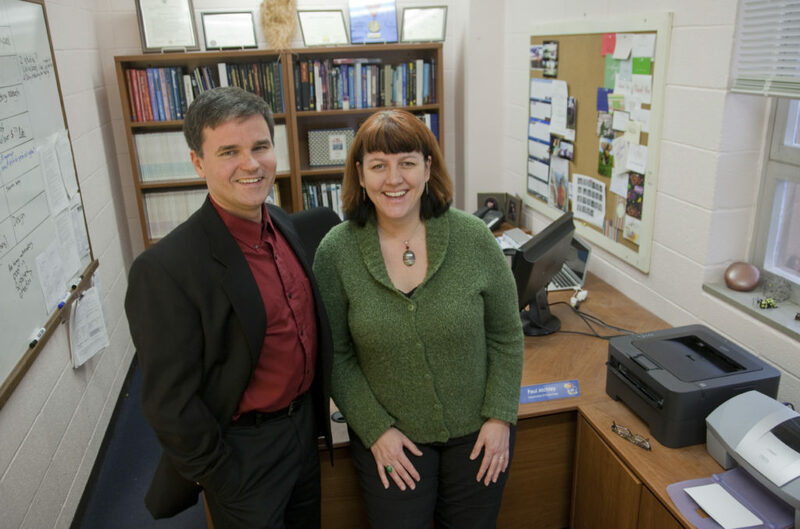 Paul and Ruth Ann Atchley work together in the psychology department at Kansas University. Those thoughts are shared by Ruth Ann Atchley, a cognitive neuroscientist and the chairwoman of the psychology department at Kansas University, whose husband, Paul Atchley, works in the same department. Paul says he believes the best parts of working with his wife, Ruth Ann, is their ability to understand each other’s successes and challenges in academia. “We know from research that community is important. A community to share information with, a community of support,” he says. Besides the Atchleys, there are four other working couples in the psychology department and several couples on campus in different departments. Ruth Ann pointed out that in the professional field of academia, married couples are common. “As the chairperson, hiring couples is an excellent unquestionable hiring tool,” she says. Working in academia is a unique beast, Ruth Ann says. The Atchleys have been together since graduate school at the University of California, Riverside. They have been a couple for close to 20 years. A few suggestions from Ruth Ann to other couples contemplating a professional working relationship include being cognizant of what the other can offer you professionally, being self-aware in words and actions, and being emotionally mature and respecting of yourself. The Atchleys will be celebrating Valentine’s Day by attending “Mama Mia” at the Lied Center. For many years they were “anti-Valentine’s” but have changed their tune. They are in favor of celebrating their love and relationship throughout the year, especially on their wedding anniversary. “Keep your anniversary sacred and take a minute to be grateful for the relationship you have,” Ruth Ann says.